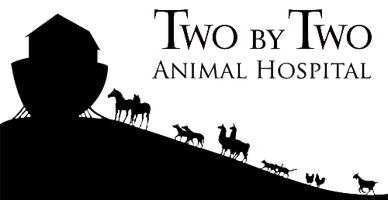 At Two By Two, we strive to stay on the forefront of veterinary medicine. Our industry is focusing more and more on disease prevention and helping pets live healthy lifestyles. "Wellness" refers to all the ways we can help your pet live a long and healthy life. We help you take an active role in your pet's health and tailor vaccines, parasite prevention, diet, exercise, and baseline diagnostics to fit your lifestyle. Annual, or biannual, exams are an important way for us to help you stay on top of your pet's health care needs. Once we get a diagnosis we can either hospitalize your pet (if needed) or send you home with appropriate medications. If we feel that your pet needs more diagnostics at a specialty hospital we will help you with a referral. Our doctors all enjoy surgery, from routine spays/neuters, dentals, C-sections, abdominal exploratories, to mass removals. There are a few select specialty surgeries that we do not perform (ie orthopedic), but we can help you find a referral hospital for your needs. Several of our doctors share an interest in working with horses and/or small ruminants and camelids. We even treat the occasional pot-bellied pig! We have a portable x-ray and ultrasound unit for equine patients and can help you with everything from routine vaccines/coggins, to pre-purchase exams, to lameness evaluations. We also work with an equine dentist; Dr. Balsis schedules entire days to accompany him and provide anesthesia/sedation during his procedures. Farm calls have to be scheduled in advance, due to our busy schedule, so please call ahead! Our doctors have experience with exotic pets. Some prefer to only see rabbits or guinea pigs, others will work with birds, reptiles, etc. However, we are NOT a specialty hospital. We can provide wellness exams for many species, blood sexing for birds, trim nails/beaks/wings. We can also treat a variety of illnesses, but a specialist may be suggested for dealing with certain diseases/specialty equipment. Please note: we have 5 doctors at our practice and we share emergency duties with another local vet clinic. We rotate our weekends and holidays between our doctors and Dr. Ed Blesy from St. Joseph Animal Wellness Clinic. This means you may be put in touch with any of the 6 rotating doctors AND this doctor will be covering patients from multiple clinics. You will most likely be asked to leave a message on the doctor's voicemail and receive a call back as soon as possible. If the doctor is on the phone or working with another patient you may experience a delay. If you feel that your pet needs 24-hour care, or if you have not received a call back from the doctor in a timely manner, you can call any of the following emergency clinics. Unfortunately, these are the closest hospitals available. Finally, we understand that euthanasia is a difficult and sensitive time. We are available for end of life preparation/guidance, hospice-type medications, and euthanasia. We do provide the option of home euthanasias for our current clients, after the doctors and owners have discussed the situation. We do our best to accommodate your wishes, but if a home euthanasia is requested we need as much time as possible to facilitate this. We do have a conversation with every owner when it's time for euthanasia- just to make sure everyone understands the options and process. We also work with a wonderful cremation service, Noah's Pet Cemetery & Pet Crematory, who can provide you with your loved one's ashes and/or memorial paw prints. We can always rely on Two by Two to be efficient, courteous, and compassionate when it comes to providing care for our dogs! !